‘Ornamentation’ means to decorate singing. The decorations can be both melodic and rhythmic. They are also known as ‘fast phrasings’, rapid ‘runs of notes’, or (in classical music) ‘coloratura’ or ‘melisma’. Fast phrasings or melismas are often used in world music, Gospel, R’n’B music and many operas. Ornamentations are most likely produced in a combination of various levels from 1-6 (see ‘Levels of the vocal tract’), with the vocal cords producing the pitch, and the vocal tract producing the grid. Some find it very difficult to make a rapid run of notes even and equal as they can often become untidy and un-rhythmic, and the melodic line can become blurred, hazy and indistinct. 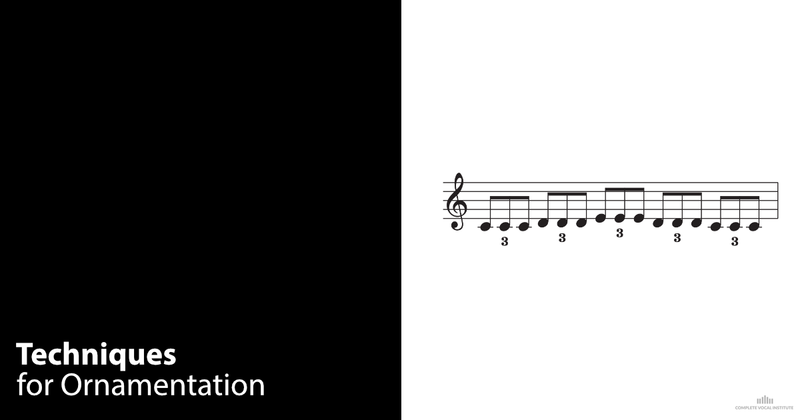 You can achieve an even and equal rapid run of notes by using Ornamentation technique. However, before you can benefit from the technique, you have to know exactly which notes you want to sing in the ornamentation. If you do not know this, the ornamentation is rarely successful.